This keyless remote programming instructions work for dot remote with part # GD7D-67-5DY and FCC id CWTWB1U411 on the back of it. 6. All transmitters need to be programmed at this time, including the old ones. Push any button on a transmitter two times. 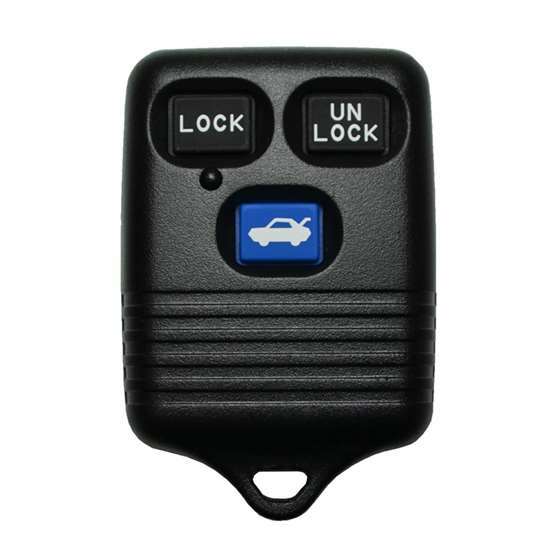 The door lock actuators should lock then unlock or a chime should sound at this point signaling that the vehicle has accepted the new transmitter code. a. If there is only one transmitter, press any button on the same transmitter twice until the door lock actuators lock then unlock or a chime sounds. Repeat this step one last time with the same transmitter for a total of three programmings. b. If there are two transmitters, press any button on the second transmitter twice until the door lock actuators lock then unlock or a chime sounds. Repeat this step one last time with the second transmitter for a total of three programmings. c. If there are three transmitters, press any button on the second and third transmitters twice (one after another) until the door lock actuators lock then unlock or a chime has sounded for each of the three transmitters. Labels: 1998, 1999, 2000, 2001 Mazda 626, with part # GD7D-67-5DY and FCC id CWTWB1U411 on the back of it.